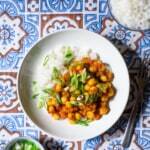 This easy chana masala recipe is perfect for meal prep and can be served in a variety of ways. Plus, it freezes perfectly. Heat the oil in a medium pot over medium-low heat. Add the onion with a pinch of salt and cook until softened and translucent, 5 to 7 minutes. Add the garlic, ginger, garam masala, cumin, and pepper flakes and cook for 30 seconds. Add the chickpeas, tomato sauce, water, lemon juice, turmeric, pepper, and a pinch of salt. Stir to combine, cover with a lid, reduce the heat to low, and simmer for 15 minutes, stirring occasionally. Stir in the raisins. Taste and adjust the seasonings, if needed. Serve with scallions. To cook chickpeas from scratch, soak them in a large volume of water for 8 to 24 hours. Drain, place in a large pot, cover with at least 2 inches of water, and season with a generous pinch of salt. Cover, bring to a boil, and simmer with the lid ajar until the chickpeas are cooked through, 45 to 60 minutes.